There are literally dozens of truly good baseball movies. Among the best, and far too often overlooked, is the heart-rending, intense biographical drama which chronicles the mental breakdown of Jimmy Piersall -- FEAR STRIKES OUT. Superbly directed by Robert Mulligan, who later went on to direct TO KILL A MOCKINGBIRD, this compelling true life father-son story is brought to the screen with Oscar-worthy performances by Anthony Perkins and Karl Malden. What makes this exceptional movie even more special to me, personally, is my friendship with Karl Malden and his lovely wife, Mona, which dates back almost 20 years when I Co-Produced another father-son drama -- BILLY GALVIN. Shot in Boston, the same city where Jimmy Piersall goes gonzo, I can honestly say that my limited time with Karl, both on and off the set, ranks among my most cherished film experiences. Simply put, there is no finer person in the business. 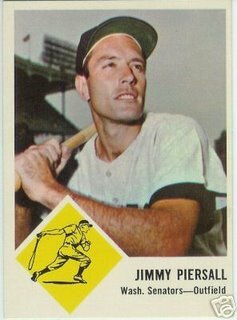 Ironically enough, I have also spent several days in the company of Jimmy Piersall when, as a "rookie" at the Chicago Cubs Fantasy Camp, I had the privilege of having him serve as my outfield coach. In those friendly confines of Wrigley Field I was amused and verbally abused (what fun!) by Mr. Piersall who remains incredibly intense in everything he says and does. 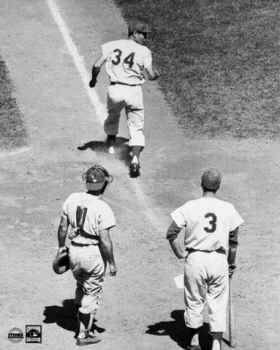 From first-hand experience I can truly say that Piersall's acerbic scarcasm has no peer. Even in his mid-70s or so, he was more tightly wound than a Tesla coil; I have never met anyone like him. Do yourself a favor and tune in the next time Turner Classics screens FEAR STRIKES OUT. It is a superb film that will stay with you far longer than a couple of Dodger Dogs. The baseball card you have featured is a 1963 Fleer. During a time period when the baseball card market was cornered by Topps, Fleer attempted to breakthrough with this small set that is now hard to find. And, oddly enough, their free enclosed treat was not a slab of stale bubblegum, but rather a COOKIE. Cinammon flavored, I believe. The claim to faim of this set is that it featured the only baseball card ever issued of Tom Cheney, the pitcher who holds the record for most strike outs in a single game with 21. That's right...TOM CHENEY. Not Roger Clemens, not Randy Johnson, not Kerry Woods. And thus ends "Baseball Card 101".